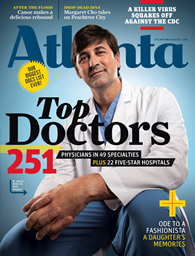 Atlanta Magazine's 2010 Top Doctors edition. A listing of "Top Doctors" at Emory Healthcare is available online. According to a survey of Atlanta doctors published by Atlanta magazine in its July 2010 "Top Doctors" issue, 97 of all 251 doctors selected for recognition are Emory Healthcare doctors and Emory School of Medicine faculty. Atlanta magazine held a celebration at an event on June 10. A national firm compiles a list of doctors nationwide that represents leading doctors in key regions and cities of the United States. "We are pleased to learn of the recognition of Emory doctors recently highlighted in the Atlanta magazine top doctors issue," says John T. Fox, CEO and president of Emory Healthcare. "Physicians practicing at Emory not only provide excellent patient care but they also pioneer discoveries that advance our understanding of disease prevention and patient care. Atlanta magazine helps bring awareness of excellence of Emory doctors." New York-based health care research firm Castle Connolly Medical Ltd. uses a survey and research process involving tens of thousands of top doctors across America and the medical leadership of leading hospitals. Atlanta's top doctors are selected after peer nomination, extensive research and careful review and screening by Castle Connolly's doctor-directed research team. Atlanta magazine uses the research by Castle Connolly to provide detailed information about education, training and special expertise of Atlanta doctors. Doctors do not and cannot pay to be selected and profiled as Castle Connolly Top Doctors. "The fact that Emory doctors were selected by their peers in Atlanta to receive this recognition says a lot about the level of expertise in our health system," says Fox. In addition to Atlanta magazine's listing showing that Emory doctors were 44 percent of the top Atlanta doctors, Castle Connolly will issue "America's Top Doctors," a national guide that profiles more than 5,000 top specialists throughout the United States, including these Emory doctors. The doctors in this guide represent the top 1 percent in the nation, according to Castle Connolly.